"Throne of Atlantis" - Chapter Three: "Friends and Enemies"
A man from Atlantis named Vulko has been taken to the Watchtower by Superman and Wonder Woman. Vulko is a very close friend of Aquaman, and was the former Royal Advisor to Aquaman when he was king of Atlantis. Aquaman considers Vulko to be like family. Vulko is talking to Cyborg about the crisis. He says that citizens of Atlantis worry about threats from outside our world, such as Darkseid. But they also worry about threats from our own planet; from the surface world. There is a history of Atlanteans being slaughtered by surface dwellers and environmental disasters polluting their oceans. A recent missile test did endanger Atlantis, although the Tomahawk missiles likely went off-course as a result of sabotage. Atlantis is responding by enacting a war plan that was co-written years ago by Aquaman and his brother Orm, when Aquaman was in a different frame of mind. Orm is leading the Atlantean troops, who are waiting just below the surface of the water until Orm gives the word to attack. The plan calls for flooding initially, which we have already seen in Gotham, Metropolis, and Boston. The next step is the ground assault. Their ultimate goal is to sink a city from the surface world. It must be one of the cities that they flooded. Orm has decided on Boston. Vulko says that Aquaman must be given time to reason with his brother; because the war must be averted. The soldiers have not yet risen up from the water; but the tidal waves have already killed hundreds. Tensions are high. Vulko feels honored to learn from Cyborg that he is considered one of Aquaman's mentors. Another such mentor is Dr. Shin, who is an expert in Atlantean biology and history. Dr. Shin will be targeted in accordance with the Atlantean War Plans, because the Atlanteans once considered him a severe threat. Dr. Shin's knowledge will indeed make him a key figure in attempts to stop the attack from Atlantis. Cyborg decides he must go bring Dr. Shin in. He uses his Boom Tube technology to get to Dr. Shin quickly. But some sinister-looking humanoid from under the sea with webbed hands is interested as well. He locates Dr. Shin and arrives just after Cyborg does. The creature summons others to assist him in assaulting Dr. Shin. In Boston, Aquaman is clutching Batman's throat rather aggressively. Aquaman wants the Justice League to hang back; because if they attack Orm, the Atlantean troops will rise out of the water in attack mode. But Batman and Wonder Woman are in no mood to placate the Atlanteans, because many people drowned in the tidal waves they caused. Aquaman is trying for a diplomatic solution. But the Justice League members want to stop Atlantis by using force. Aquaman tries to explain that if he successfully commands the Justice League to back off, this will show strength to his brother, due to certain values in Atlantean culture. But Batman and Wonder Woman refuse to cooperate, because so many people were killed. Orm shows up during this discussion. Aquaman tells his brother to keep a distance. Aquaman is trying to keep everybody separate, to keep a lid on things. In an aggressive maneuver, Batman hurls pure potassium in Orm's direction to cause a volatile chemical reaction with the water. Aquaman loses his temper and lands a hard punch to Superman's face, trying to get the Justice League to back off. Aquaman says he is trying to protect both worlds; but Wonder Woman says that if it was the Amazons attacking, she would side with her Justice League friends against the Amazon invaders. Wonder Woman and Aquaman continue to argue as they grapple. Orm attacks Batman with some sort of energy force; perhaps electricity. He prepares a second energy charge to finish Batman off; but Arthur steps in to protect his friend Bruce. Orm is confused about Aquaman's loyalties, and they argue. Aquaman again tells Orm to take the troops and go back to Atlantis; but Orm is defiant. 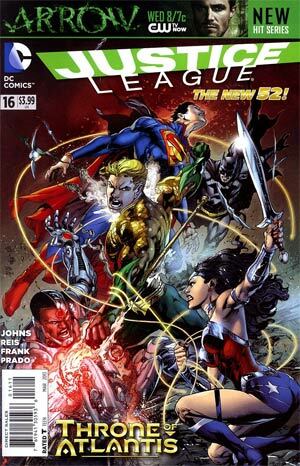 Wonder Woman grabs Orm and orders him to surrender, but in response the Atlantean troops rise out of the water. Orm says it is time for war. Wonder Woman is hit with an energy blast similar to what was used on Batman, and she reacts in pain. Shifting scenes, we see several of the sea creatures attack Cyborg. Cyborg grabs Dr. Shin and "Boom Tubes" them out of there and back to the Watchtower. Back in Boston, Superman recovers from Aquaman's blow and takes charge. He is protective of Batman, who is unconscious from the energy blast. Wonder Woman is courageously fighting several Atlantean troops at once. Aquaman commands the troops to put down their weapons, but he is no longer their king, so they ignore him. Orm causes a massive waterspout to engulf Wonder Woman. Superman is getting really miffed. He crashes through the wall of water to save his girlfriend; and then commands the Atlantean troops to retreat. He gives a massive blast of heat vision to emphasize the seriousness of his demand, causing the water to heat up. But Orm is defiant, and sends energy blasts towards Superman, Wonder Woman, and Aquaman, stunning them. Orm says he is exiling them to dark waters. At the Watchtower, Cyborg, Vulko, and Dr. Shin discuss the situation. Vulko says they have to do something quickly because Arthur and the Justice League have been taken prisoner and are being held captive underwater. Meanwhile, Orm declares that they will sink Boston today. Victor teleports himself to his dad, Dr. Silas Stone, at S.T.A.R. Labs in Detroit, using the Boom Tube. He asks his Dad to make modifications to Vic so he can function underwater. Silas reminds his son that this will require the sacrifice of Victor's remaining lung; but Cyborg is willing to make that sacrifice. Since the surgery will take a few hours at least, Cyborg calls in reinforcements. Connecting to his electronic "grid," Cyborg contacts heroes who have been considered as candidates for membership, have not been vetted, but are now urgently needed: Element Woman, Green Arrow, Black Lightning, Shazam, Hawkman, Vixen, Zatanna, Goldrush, Black Canary, and Firestorm. Cyborg welcomes them to the Justice League. The story will be continued in Aquaman #16. Story - 5: I am enjoying this story immensely. 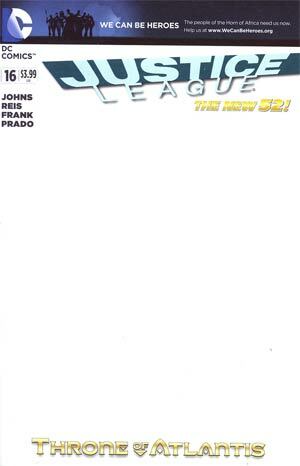 Geoff Johns has produced a real gem for us to enjoy. It is good to see Aquaman at the center of things this time around. This series is crossing over into Aquaman's own book. In case you do not read that book, I have included a couple of key details from Aquaman #15 in the first two paragraphs of my synopsis. That way, you will not miss any important details. I will continue to do this for the duration of this crossover series. However, if you are not reading Aquaman, I urge you to give that book a try. Geoff Johns is doing some good stuff in Aquaman. The title of this installment, "Friends and Enemies," gives a clue one of the main themes of this story... Loyalty. Poor Aquaman is really on the spot. He is the only one who knows both sides intimately. He is really caught in the middle. He is trying desperately to keep things under control; but emotions are running too high on both sides for people to be cooperative. Aquaman looks frustrated; and well he should be. Aquaman is the voice of reason throughout this story. For example, Orm says that Batman "raised his hand to me - ME, the king of Atlantis. It is my right to kill him." Aquaman's reasonable reply is that, "Atlantean law doesn't apply here." But nobody is listening to Aquaman. Throughout, Aquaman attempts to reason with everybody, but his efforts are in vain. Every time he tries to get folks to back off, somebody makes an aggressive move that escalates the conflict. Orm is very confused by his brother's actions. From his point of view, Arthur has threatened him, then attacked the Justice League, and is now threatening Orm again. Orm is questioning Arthur's loyalties. But there should be no confusion. Aquaman's loyalties are with the Justice League. In Aquaman #15, he makes this very clear. Batman, when speaking to Aquaman, uses the phrase "your people". Aquaman adamantly exclaims "They are not my people." Aquaman explains to Batman that when Darkseid came and the Justice League was formed, it gave Aquaman someplace to go; a place for Aquaman to belong and find kindred spirits. Aquaman only briefly attacks Batman and then Superman here out of sheer frustration, because he is trying to prevent a war, and nobody is listening to him. Which brings me to my next point. Geoff Johns has really amped up Aquaman's power level since the New 52 began. For example, back in Aquaman #1, when some crooks in a truck attempted to run Aquaman down, he spears their grill and flips the truck over as easily as I might flip a couple of eggs in a frying pan. This makes sense to me. A man who is able to swim at amazing speeds or endure water pressures in the depths of the ocean should be very, very strong. I approve of this change. But strong enough to throw a punch and hurt Superman?! I don't think so! Aquaman himself makes this clear, on page 13. "Superman's the most powerful being on the planet, Orm." I couldn't have said this better myself, Aquaman. I am looking forward to seeing how things progress, in Aquaman #16, and then back here in Justice League #17. 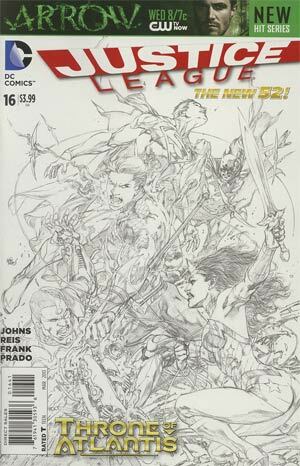 Art - 4: Ivan Reis and Joe Prado are settling in nicely as the artists on this book. These pages really sparkle! Doctor Sivana is walking down a city street in New Jersey with Sloth, one of the Seven Deadly Sins. Sivana expresses that he was not surprised that magic exists, but is very surprised that sentient beings exist who are the embodiment of these sins. They have gone there to find Pride, who like the other sins has a curse of amnesia. Sloth uses the magic lightning to wake his sister up. When one of the workers intervenes, Sloth puts him to sleep using the magic. Black Adam and Shazam have come face to face for the first time. After some small talk, Black Adam lashes out with a magical attack on Shazam, which sends him hurtling through the window of a department store. Black Adam keeps up the attack as Shazam tries in vain to defend himself. Black Adam says he wants all of Shazam's power. Black Adam pounds Shazam some more. Shazam escapes and uses the magic lightning to transform back to Billy Batson and hide. Black Adam looks for him, saying, "I will find you. And I will kill you." Story - 3: If the Wizard is watching, I am sure he is disappointed in his choice for a champion. So far, Shazam has raided an ATM machine, charged somebody $20 for stopping an attacker, and has failed badly in his first encounter with Black Adam, finally running to hide. I am disappointed in him as well. I hope he learns to live up to the huge responsibility that has been given to him. Art - 4: Gary Frank does his usual solid job. 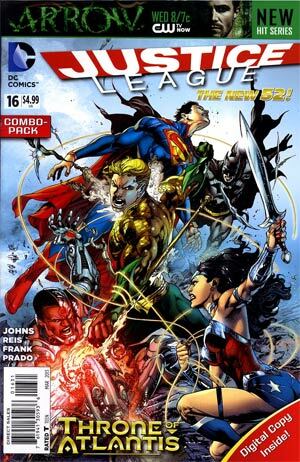 Cover Art - 4: Aquaman is battling the other members of the Justice League. He stands in the center and is surrounded by his temporary adversaries. The sense of action and emotion nicely reflects the book inside. I like this cover. 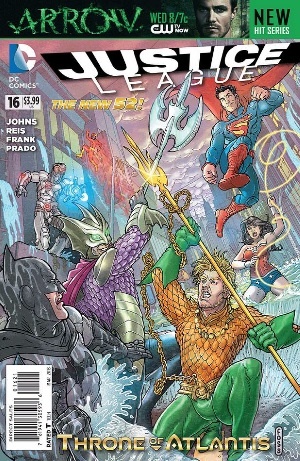 Cover Art (Variant Edition) - 2: Aquaman battles his brother while the entire Justice League looks on. This image is kind of grainy, and not to my liking.